Click on the image to check out a new paper, “Manage your Medicaid program and population for the best financial and health outcomes." Today’s Medicaid environment is drastically different from that 5, 10 or 20 years ago. Medicaid enrollment has grown to monumental heights with recent CMS numbers (April 2015) at over 70 million. As enrollment rises, concerns about efficient management of care access, cost, quality, and effectiveness have become even more prominent. The rise in enrollment brings with it a mountain of data, not just from Medicaid systems but other areas such as social services. With over 70% of Medicaid members participating in some type of managed care plan, many States are relying on their Managed Care Organizations (MCO’s) for the bulk of their encounter data, MMIS vendors for Fee for Service data (and some encounter data) and other government agencies for social service data. This data could include education, child and family services, housing and other forms of public assistance. This creates serious data management/analytic challenges. As states look to support a healthier Medicaid population, enterprise analytics will play a key role in holistically analyzing data from all sources. Near real-time predictive and data visualization can deliver the right insight at the right time to support a truly integrated, team-based approach to service delivery. 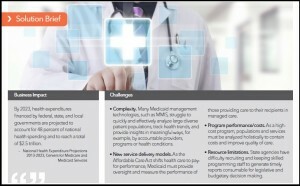 Data and analytic challenges are nothing new to Medicaid organizations, and the benefit of time has led to advancements which significantly enhance Medicaid management capabilities across the Medicaid/Social service eco-system, and support integrated care efforts. CMS, for example, continues to push more integrated approaches to the delivery of behavioral, physical and social services through the MITA framework, Innovation lab, State Innovation Models and other mechanisms. In addition, CMS recently released proposed rules for states to take an enhanced oversight role with managed care, including: analyzing/optimizing MCO effectiveness, strategies for quality improvement, program integrity efforts and participation in multi-payer/provider arrangements. Further, many states have also made strides with their own Medicaid management program initiatives. There now exists an essential need to integrate the delivery of behavioral, physical and social services and associated data. Enterprise analytics and data visualization will be key to better understanding this data and the complex inter-dependencies of behavioral and physical health and social services. Analyzing and projecting cost and quality of care to better understand the impactful relationship between healthcare and social service data. E.g. how can total cost of healthcare be mitigated in near and long term by making program changes to other social services a member may be receiving? Many traditional Medicaid systems are severely challenged to provide the capabilities described above, in an expeditious (near real-time) manner. They are often stuck in a reactive analytics state, focused on what has happened instead of moving towards a more prescriptive view. As states are required to meet the complex demands of their Medicaid members, it is vital they continue to innovate and modernize across the Medicaid eco-system and continue to work towards a prescriptive environment. The majority of modernization initiatives supported by CMS and states themselves must have the ability to analyze data across not just Medicaid but the convergence of Medicaid, social services and more. An enterprise analytic environment that provides a 360 degree view of a member, and uses predictive analytics is essential to this ability. The results are enhanced quality of care, reduced costs, better access and effectiveness and a more collaborative approach for delivery of Medicaid and non-Medicaid services.